Go behind the scenes with twenty-five leading professionals and explore what makes their work unique. Whether you're looking for tips on location selection, better time management, posing cues, lighting insights, or some new ideas for shooting the reception, you'll find the answers at your fingertips. Music-photographer turned wedding shooter Angela Hubbard (Rolling Stone, Spin, Vanity Fair) shows you how to design iconic images of your couple. Jim Garner, named one of the world's top-ten wedding photographers by American PHOTO Magazine, reveals how a change in his products and design strategy revolutionized his approach to shooting weddings. 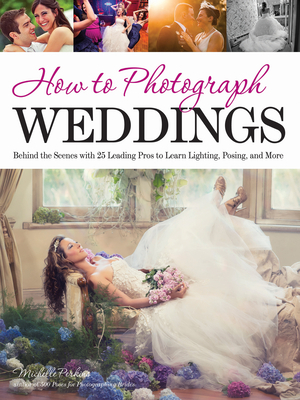 Anne Almasy (Huffington Post: Wedding blogger) and Catherine Hall (named Best Wedding Photographer by The Knot) explore the role of emotional and personal connections on your images. Also featured are images and fascinating insights from acclaimed artists: Dave & Quin Cheung, Salvatore Cincotta, Bob & Dawn Davis, Tracy Dorr, Brett Florens, Jim Garner, Jerry Ghionis, Michael Mowbray, Christie Mumm, Josh Newton, Huy Nguyen, Kristi Odon, Dennis Orchard, Srinu & Amy Regeti, Ken Sklute, Damon Tucci, Neal Urban, Riccis Valladares, Paul Van Hoy, Neil Van Niekerk, Ethan Watts, and Stephanie Zettl.